NASN is a national partner in the initiative Expanding Partnerships and Disseminating HIV Prevention Materials to Reduce HIV and other STDs among Adolescents through National Non-Governmental Organizations (PS16-1603). The initiative is funded by the Centers for Disease Control and Prevention (CDC) Division of Adolescent and School Health’s (DASH). It was created to increase education of key stakeholders on CDC-developed approaches to school-based programs for creating healthier adolescents (10-19 years old) by reducing HIV and STD infection. 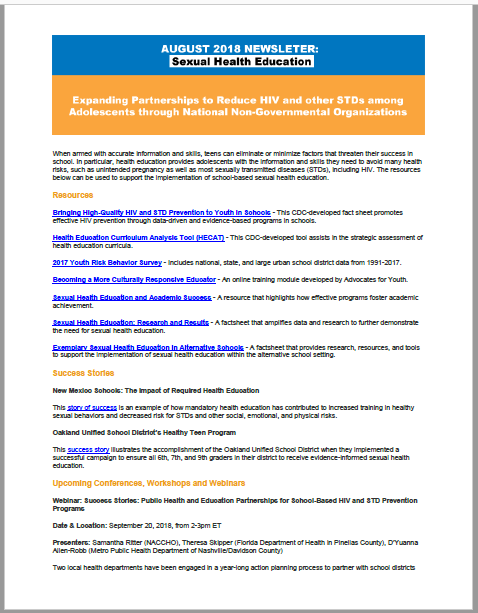 The initiative's August 2018 newsletter features health education resources, success stories, and upcoming events.